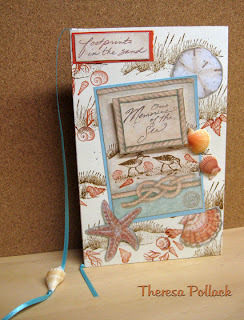 This Stamp TV 3D challenge was to alter a book..notebook, notepad, etc. Cover was made of Kraft CS stamped and embellished with cutouts from Susan Winget Scrapbook Paper. Cover goes around notepad and has pocket insde. Added ribbon and shell for a bookmark. Shorebirds, Sand Dunes, and Grass from Seaside Stamping . Seashells from Rubber Stamp Tapestry. Sentiments: Cut from Susan Winget Paper. Mats for sentiment : Orange and Blue from Scraps. Ink: SU Really Rust, Basic Brown. Seashells: Collected from beach at Captiva Beach, Fla.( Most fun part of this project.) Ribbon from Stash.